St. Maximus the Confessor explains to us that nothing that God has created is in itself bad. It's the gluttony that is bad, not the food. In this session, Rita looks at snacking and how it can have a negative impact on our health. She also provides some practical tips for moving away from mindless snacking. Welcome to another session of Food, Faith, and Fasting. Today we are going to continue to build on this aspect of portion control, the reason being that we know that this is something we need to handle to bring our eating into a spiritually minded act. St. Maximus the Confessor has wonderful writings, and I want to just share [with] you a little part that’s very relevant to what we’re talking about today. Nothing that God has created in itself is bad. Food is not bad; gluttony is. Glory is not bad; vainglory is. And he goes on and on to list some others. What we’re recognizing here is that food is not bad, but what we do with the food can make it bad. So as we mentioned before, filling up our bodies with foods that are just loaded with synthetics and artificial flavors and artificial preservatives and additives, this is doing nothing to nourish our bodies. But also, when we eat too much, this can also weigh down our bodies. And remember what St. Seraphim of Sarov has taught us: when we tire our bodies from eating too much, our soul also weakens. So again we see this relationship from eating too much and our bodies being fatigued and tired out so we cannot perform the work that we are called to do in the day or we cannot practice our spiritual disciplines or be faithful in our prayer life. It’s interesting. We all know what that over-the-edge bite is at the meal, right? It’s kind of that bite that officially ruins the meal. Like we were talking about last session: do we like foods because we love that feeling of being uncomfortably stuffed, when we have to just unbuckle our pants and just sit there for three hours while the food digests, or we like food because of the way it tastes? Everyone knows the answer: we like the way it tastes. So we need to sit down and honor mealtime, taste our foods, slow down our eating pace, and that will allow ourselves to listen to our bodies to know when that bite is going to be the bite that overly satisfies us. You know, it’s actually interesting because this really started to be promoted when they realized people were having breakfast and then they were having a snack, and then they were having lunch and then they were having a snack, and then they were having dinner and snack, snack, snack. A lot of this extra snacking could be due to eating very, very low-fat meals and then feeling hungrier way sooner, because, again, when you add a moderate amount of fat back into your meals, you’re able to make it a longer period of time between eating. On average, humans should be able to make it about four-and-a-half to five hours without food. If you’re feeling hungrier sooner than that, you might need to go back and look at your meal and see if it was balanced, see if you did have a moderate amount of fat and protein at the meal. Now, when we’re doing fasting and we’re focusing more on eating a diet that’s richer in carbohydrates, what do you notice? You notice that you feel hungrier sooner, right? 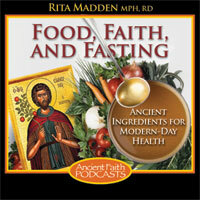 But again, we’re going to talk about fasting in sessions to come, so I don’t want to get into that too much right now. The important thing to recognize here is that a moderate amount of fat can work to help keep us satisfied between meals. Adding 30 calories in the form of a fat to your breakfast, whether it be in the form of some peanut butter or some cream on your oatmeal. That 30 calories in the form of a fat can help to prevent a 200-calorie mid-morning snack, so at the end of the day, who’s eating [fewer] calories? What I want to continue to focus on, as we go through this specific lecture, is mindless snacking. I really want you to focus on this, because we’ve almost convinced ourselves that, “Oh, it’s 2:00 p.m. I’m hungry. I need to go have a snack.” We’ve gotten into this habit. We’ve gotten into this habit that after we eat dinner and we sit down in front of the television, we have a snack. We’ve gotten into the habit that, in our workday, 10:00 a.m. comes along: that’s time for me to go to the break room and see what’s in there and have a snack. If you are truly hungry, this is, yes, a proper time for a snack. But what would that snack look like? What is a proper snack? Obviously, it’s something that contains nutrients. When you’re hungry, your body’s essentially asking for nutrients. It’s asking for healthy fuel. It’s not asking for a bag of Twizzlers. It’s not asking for a bag of chips. It’s not asking for a piece of double-chocolate cake. These foods need to [be] put in their proper context. There’s nothing wrong with having a piece of chocolate cake, but chocolate cake isn’t a snack. Chocolate cake is a dessert that should be utilized as a food to maybe celebrate, to be tagged onto a special meal, to make that moment a celebration time, and utilizing food to celebrate a feast in its proper context is an okay thing to do. But now what happens? We walk into the post office to mail a letter, and there are candy bars that are developing voices and talking to us. We buy one in the post office line, and before we are even done mailing our letters, we’ve just consumed a candy bar. We need to start to be mindful of our snacking. Let’s say you knew you were not going to eat until another three hours. You finished you workday and you weren’t going to have dinner until nine o’clock at night. Again, that’s an okay thing to do. It’s okay to eat after 7:00 p.m., as long as you’re not over-going your calories for the day. It’s good to go ahead and eat a dinner late at night. Your body actually burns calories while you’re sleeping as it goes through the cell-repair process, so there’s nothing wrong with that. So let’s say you’re going to have that late dinner, and you finish work up at four, and let’s say dinner’s not going to be until eight. That might be a proper time for a snack. But if dinner’s going to be around 5:30, you might want to think about waiting it out. Try to see if you can make it to the next meal without participating in just mindless snacking. I think she emphasized something very important there. It is okay for us to feel hunger. It is okay for that feeling to be there, but we’re living in a culture where, as soon as we feel hungry, we automatically take care of that hunger. What I want you to try to do this week, one of the assignments that I want you to try to do is see if you can wait it out, especially, like I said, if dinner’s going to be within a half-hour to an hour, see if you can wait it out and wait until that actual mealtime. One story I would like to share with you is: I was doing some readings of the Desert Fathers before this specific talk, and I just wanted to utilize a part of this story to kind of exemplify the point that I was just trying to make. A brother felt hungry at dawn and struggled not to eat until nine o’clock. When nine o’clock came, he made himself wait till noon. At noon, he dipped his bread and sat down to eat, but then got up again, saying, “I will wait till three.” At three o’clock he prayed, and saw the devil’s work going out of him like smoke, and his hunger ceased. There’s a lot going on in this story, but what I wanted to utilize, just part of it, was to exemplify this idea of waiting it out. Instead of getting caught up in the mindless snacking and feeling, as soon as you’re hungry, like you need to address it, turn to the Lord in prayer. Be very mindful of the act of eating. I want you to also take it a step further and see if you can also wait it out for another reason. See if you’re wanting to eat out of true hunger or out of habit or out of just being bored or out of, you know what, your friend’s going to the breakroom, so “I might as well, too” or it’s just what you usually do when you sit in front of the television or eating for emotional reasons. A lot of times snacking takes place for emotional reasons. Other times, people are not sleeping well, so they snack chronically throughout their day. If they’re snacking chronically throughout their day, they’re putting on extra calories, but what’s the deal here? Food is not the problem; [their] not getting good sleep is the problem. That’s what’s causing the snack the rest of the day. So when we talk about this whole “needing to eat eight small meals a day,” again, if we were really eating that many meals a day, when would we have time to do anything else? And the reason we wouldn’t have time is because, if we were actually eating real foods, there is some preparation that needs to be involved, right? But what happens? The snacking that we’re tending to see a lot of us gravitate to is these quick, in-a-bag, processed sort of goods. So not only are unnecessary calories sneaking in, but foods that create a lack of nutrition and essentially provide calories but no nutrients are slipping in. I actually had a pretty alarming story. I was doing a food record with a child of a family, and it was in a specific area that meals were not being prepared on a regular basis, and the child’s highest percent of vitamin C was coming from a fortified candy—I believe it was Starburst or something like that. So their vitamin C, their main source was coming from a fortified candy. They’re talking about, now, even fortifying sodas, and some of them, actually, have already been fortified, as a way for people to get in the nutrition. We’re going to talk about getting nutrition from real foods as opposed to supplements again in the future, but what I’m just trying to focus on here is that the mindless snacking is usually coming in from food sources that, again, are alternatives to real foods. Now, if you are truly hungry and you know your next meal is not going to be for quite some time, this is a proper time for a snack. But let’s make sure we’re choosing proper snacks. Again, if you’re needing a snack, your body’s asking for nutrition. So snacks such as maybe some cheese and some olives or a piece of fruit and some nuts, maybe some granola, maybe some yogurt—these are better snacks than the alternative processed goods. They’re even packaging snacks in a certain amount of calories these days. This marketing is just full-force with getting us to kind of chronically graze throughout the day. For this week I really want you to focus on two things. I want you focus on seeing if you can wait out your hunger if your meal is going to be within a half-hour or an hour. Start there. Next, focus on, when you are having a snack, choosing real foods. Finally, start to kind of recognize why you’re snacking. Start to get in touch with what true hunger feels like as opposed to just habit or emotional eating. We’ll talk about that in more depth in the future to come, too. So start there, and remember: if you’re noticing that you’re not truly feeling hungry but you just want a snack for some other reason than hunger, right then and there, ask God for help, for strength. Set up a plan and try to remove yourself from that mindless snacking situation. We’ll talk more about strategies for this in detail as we move through the sessions to come. Take care.